The cover of a Christian magazine. So the feds finally recognize your marriage, big deal. Pop a cork, swig some champagne, then get back to work. You can't legislate the end of homophobia. Just look at Brazil, with its enormous LGBT Pride Marches, marriage equality, and entrenched homophobia and violence. I've been swapping messages about the state of Brazil's Queer Nation with Mariana Rodrigues, a 31 year old dyke activist who worked at Liga Brasileira de Lésbicas (League of Brazilian Lesbians) when she still lived in Sao Paolo. And she started off by telling me that despite all their legal progress, young queers that dare to come out are regularly met with fierce disapproval or even violence from family, friends and society at large. When one of her young friends announced he was gay, his father actually tossed him out of a moving car. And despite the parades, most people are still closeted at work, or they wouldn't find any. Especially feminine gay men, and butch dykes. Trans people almost never find employment in a formal workplace. Luma Nogueira Andrade, the first trans university professor in the country, is a rare exception. Now, she's actually the first trans college president in Brazil at the University of International Integration of Brazil-Africa Lusophony (UNILAB) in the northeast. She describes herself as travesti (transsexual) instead of transgender to highlight the history of stigma and violence that transsexuals continue to face. Almost one queer is killed every day in Brazil, with trans people accounting for half the victims, largely because they're forced to the margins of a society where violence is already endemic. In fact, violence against all LGBT people is increasing, especially in big cities like Sao Paolo and Rio. Mariana believes it is the beginning of an enormous backlash. Just two weeks ago, a video went viral showing a huge group of young men, called "Gladiators of the Altar" shouting that they were going to hunt down queers and kill them. They are organized by one of the largest evangelical groups in Brazil, the enormous Universal Church of the Kingdom of God. A few days afterwards, Mariana found an equally horrifying post on their website, that shows an image of a father with a gun in his hand saying, "Who else wants to admit they're gay?" The caption: "everyone should have a gun at home to solve their own problems." More and more, politicians attack LGBT people and women's rights during their campaigns, as they compete for the conservative, evangelical vote. Mariana was shocked when the Brazilian president, Dilma Roussef, actually vetoed a curriculum developed to help teachers cope better with diversity in schools. A member of the Workers Party which has been the most progressive on LGBT issues, Rouseff claimed that it was not the government's role to "spread sexual orientation propaganda." As in the U.S., the division of church and state is increasingly blurred as conservative evangelical movements elect more and more legislators, and invest entire fortunes in buying up media outlets and creating giant lobbying machines. Marco Feliciano, a staunch evangelical, is now the president of Brazil's federal council of human rights. Besides declaring that black people are cursed because they didn't worship Jesus in Africa, he's also blamed bi people for the AIDS epidemic. Jair Bolsonaro, another evangelical deputy, said that children only become gay because they're not beaten enough. Both were re-elected in a landslide. In the last election a Catholic candidate promised to create a mass movement rising up against the evil of homosexuality, which among other things, threatened the traditional family. In that case, the public defender filed a lawsuit against him because those statements were made on national television and incited hate crime. Last week he was sentenced to pay a fine which will go towards a public service announcement supporting LGBT rights, though it might be overturned on appeal. Nevertheless, LGBT activists can't keep up, and Mariana worries that evangelical politicians may actually be able to reverse decades of legal and social progress in Brazil. Just recently, a program about gender equality and sexual orientation was removed from the national curriculum after intense lobbying from evangelicals. They claimed these "theories of gender are included to propagate and encourage homosexuality in children." And in Tocantins, the state where Mariana now lives in central Brazil, LGBT activists worked for two years to pass a program containing provisions for education, health, social assistance and work, and insuring the LGBT population there basic human rights. Eight days after the plan was approved and announced, the state government caved in to pressure from Christian members and revoked the whole thing. Even when the federal government does makes progressive recommendations, they are often ignored by the state governments. (Like in the United States, LGBT rights and protections vary from state to state). Sometimes policies are passed, but not implemented because they aren't awarded funds. Other times, judges rule according to their personal beliefs rather than the laws on the books. Still, Mariana sees some positive shifts on the cultural front. A new soap opera featured a kiss by two older lesbians in the first episode. While there was a huge uproar from the evangelical population, there was also a number of strong, approving voices. This was progress from the first time there was a lesbian couple on a soap when it caused such outrage the writers almost immediately killed them off. Gay activists are organizing some beijaços (kiss-ins) to support the new show. One new twist in the ongoing war for LGBT rights, is how evangelicals are beginning to claim that they themselves are victims of discrimination against Christians. They say that gay people are the abusive majority preventing them from exercising their "right" to denounce LGBT people, and even call for their eradication. 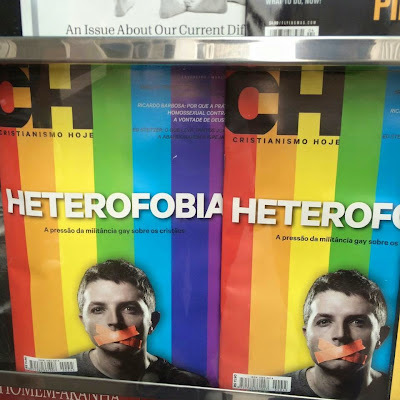 If these cries of "heterophobia" sound familiar, it's because evangelical movements both north and south are joined at the pocketbook, and the tactic has been spreading in the U.S. as well. Indiana's only a heartbeat from Brazil.